Amid allegations of transfer pricing abuse in Chile, the government needs to reinforce its monitoring of the lucrative lithium industry. Last month, Chile's government announced it was creating a committee to supervise lithium contracts the state has with U.S. based Albemarle, and local company, SQM; deals that are vital to the country maintaining its leading role in global lithium production. The declaration follows allegations about Albemarle charging below-market-prices for its lithium in sales to foreign affiliates. Between the Pacific Ocean and the snow-capped Andes, the Salar de Atacama is Chile's largest salt flat, and the driest non-polar desert on earth; 130 feet below the surface of the lake, lays a brine which contains 27 percent of the world's lithium, a silvery-white metal in the Earth's crust. Lithium, or “white petroleum” as some call it, is used to produce batteries to power laptops, mobile phones, and iPods. The turning point for the industry came in 2006 when Tesla announced plans for a battery-powered electric car with a range of 200 miles per charge. Since then, prices for the most common variety of lithium, lithium carbonate, have risen rapidly. According to metals and mining consultancy CRU, prices increased by 300 percent between 2015 and 2018 (see chart below). A report by Goldman Sachs in 2015 predicted that the size of the global lithium market could triple by 2025. Albemarle Corporation is one of the biggest winners in the lithium price boom. The U.S.-based company has 20 percent of world lithium market share. It owns lithium brine operations in the U.S.; a 49 percent stake in Greenbushes, the massive hard-rock lithium mine in Australia; and, in January 2015, it acquired the Rockwood Holdings Inc. lithium company in Chile. However, the lithium price surge has led governments to investigate whether they are getting full value for the resource. They are especially concerned about the potential for under-pricing of related party sales. “Transfer pricing” is a legitimate business practice; it is the process for determining the value of a transaction between two entities that are part of the same group of companies. However, there is a risk that companies will undercharge for production exported and transferred to related parties, in order to avoid taxes in the host country. The issue has become a hot topic in Chile. Using customs agency data, academics and the media have identified a difference of $1,800 on average between Albemarle and SQM's sale prices for lithium carbonate in 2017. Data from the Chilean Copper Commission roughly supports this conclusion. It confirms that in 2017 the average price for total lithium exports (carbonate, oxide, and chloride) was $11,169, and $8,984 for SQM and Albemarle respectively (i.e. Albemarle's price was lower by $2,185). 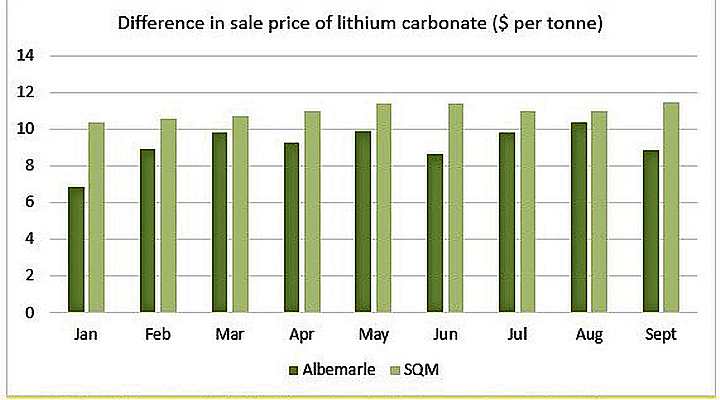 Based on Albemarle’s lithium production in 2017, the company would have collected $36 million less in sales revenue than had it used the same price for lithium carbonate as SQM. At a corporate tax rate of 25.5 percent, this amounts to approximately $9 million in forgone taxes. Assuming the average price difference stays the same, the tax gap is likely to increase to $18 million as Albemarle doubles its production in 2018. Albemarle is also being investigated in Australia, in relation to the price at which it, and its Chinese partner Tianqi, bought lithium products from their subsidiary (Greenbushes mine) in 2015 and 2016. Windfields, the private company that owns the Greenbushes mine has conceded it could face a tax bill over sales to Albemarle and Tianqi for 2015 and 2016. Albemarle sells its lithium via long-term sales contracts rather than spot sales which are likely to achieve higher prices. The allegations of transfer pricing abuse will be discussed below, taking into consideration the differences highlighted by Albemarle. According to Albemarle's website, it has been producing battery grade lithium carbonate, the same as SQM, since 2017. “Battery grade” lithium carbonate has a minimum of 99.2–99.5 percent carbonate content and reduced impurities: whereas “technical grade”, commonly used in the production of glass and ceramics, is typically composed of 99 percent lithium. According to sources, while the grade may be the same, unlike SQM, Albemarle is reporting penalties (chloride) in their exports. Lithium chloride is the original solution that is pumped from the Salar, and then treated with sodium carbonate to produce lithium carbonate. The fact that Albemarle does less refining than SQM, which processes its lithium before export from Chile, may explain the difference in chloride levels, and subsequent penalties. However, even a relatively small difference in grade can have a big impact on price. Differences in the purity of the material, and production costs mean that battery grade is $1.00–$1.50 more per kilogram (or $1,000–$1,500 per tonne) than the technical grade. 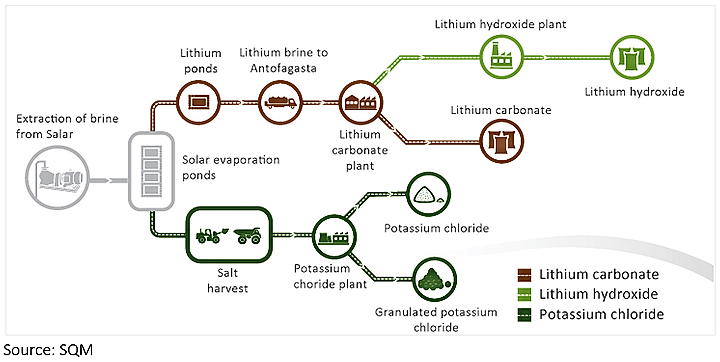 SQM processes its lithium before export from Chile. First, the brine is pumped into evaporation pools where the sun concentrates it into a yellow greasy solution. The solution is then transferred to the Salar del Carmen production facility plant where it is purified and treated with sodium carbonate to produce lithium carbonate. Finally, the lithium carbonate is filtered, dried, and packaged for shipment. Value is added to the final product, and “the tax on this value added remains in Chile,“ a source says in a translated statement. Not only does the additional processing enhance the value of the product, but it also increases the cost of production. According to the Metal Bulletin, it costs $1 per kilogram to transform lithium carbonate into battery grade [by reducing impurities]. Assuming the cost is built into the final sale price, this would explain $1,000 of the $1,800 price gap between Albemarle and SQM. Albemarle sells much of its lithium to its affiliate in the U.S., and some to Germany: SQM, on the other hand, sells a large amount of its production to affiliates in China for further processing. 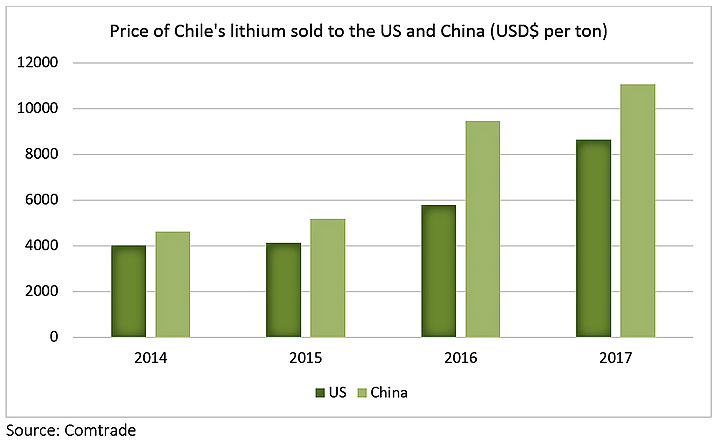 According to trade data, the value of Chile's lithium carbonate exported to the U.S. is $1,700 less on average than the lithium going to China. 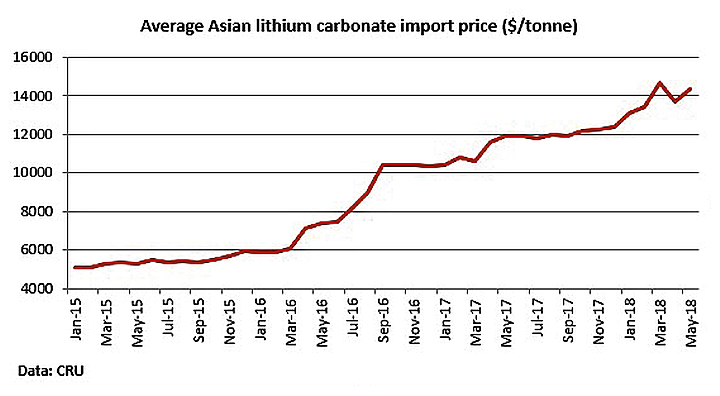 This suggests that the implied price of lithium carbonate sold to U.S.-based entities is well below the price received in lithium sales to China. The variance could be due to Chinese companies paying more for lithium in order to control the electric vehicle supply chain, plus the additional cost of shipping and transportation. There is also less cathode production in the U.S., which means lower battery grade lithium imports, and lower trade values. While trade data cannot always be relied upon, according to the media, in 2017, Albemarle charged its U.S. and German affiliates an average of $6,665 and $7,287 per tonne of lithium, and its Chinese customers $10,776—a difference of 63 percent. There is a spot market for lithium (i.e. buying or selling a commodity for immediate settlement), but volumes are very small. Most of global lithium production is sold via offtake agreements (i.e. an agreement entered into between a producer and a buyer to buy/sell a certain amount of the future production). Benjamin Jones, Managing Consultant at CRU said “according to our intelligence reported Lithium spot prices have been more volatile and well in excess of contract prices —more than 100% higher during most of 2016, with premiums falling to around 50-80% in the subsequent period.” This could explain the price difference if Albemarle is selling mainly via contract rather than spot. In the past, there has been a lack of benchmark prices, making verification difficult for tax authorities. However, in 2017, the Metal Bulletin launched contract and spot reference prices for lithium carbonate. In future, the Internal Revenue Service of Chile (“SII”) could use the spot price on the date of signing as a reasonable guide to the average contract price, depending on offtake provisions, financing, and customer specifications. They could also demand that offtake agreements stipulate an annual price review to limit the risk of artificially low negotiated prices, as Galaxy Resources did in relation to its sales to customers in Asia. The London Metals Exchange also looks set to launch the world's first lithium futures contract, which could be another useful data point for tax authorities. CORFO has requested that Albemarle sign an advance pricing agreement (“APA”) with the SII. Albemarle's Australian subsidiary also made a request to the Australian Tax Office (“ATO”) for an APA for 2015 and 2016. An APA is an agreement, usually for a fixed period, between a taxpayer and at least one revenue authority, specifying the chosen transfer pricing method that the taxpayer will apply to a particular controlled transaction; the revenue authorities commit to not making any adjustments during that period. The main advantage is that an APA locks in a method for determining the transfer price up front, reducing the need for complex transfer pricing analysis. Also, during the negotiation, the SII would get access to detailed pricing information from Albemarle that would help build its industry knowledge. The SII could also make a request to the ATO for information regarding Albemarle's operations in Australia. In 2013, Chile and Australia signed a Double Taxation Agreement (“DTA”). Under the DTA, SII can request such information from the ATO that would be helpful in preventing tax avoidance—for example, information on Albemarle's operations, pricing structures, and production costs, bearing in mind that the Greenbush mine produces hard-rock lithium rather than brines. In the past year, Chile's state-owned mining company, Codelco, has also entered the lithium space, providing a future source of industry information, as well as domestic comparables. A Chinese Monopoly—a Further Transfer Pricing Risk? Earlier this year, Tianqi, the Chinese company, paid $4.1 billion to become the second-largest shareholder in SQM. Along with the stake in SQM, Tianqi owns 51 percent of Australia's Greenbushes mine in a joint venture with Albemarle. As a result, the company now has effective control over nearly half the current global production of lithium, as well as a monopoly in Chile. CORFO has complained that Tianqi's control on lithium could “ gravely distort market competition.” In terms of transfer pricing, the monopoly could further reduce the volume of independent transactions available to generate appropriate benchmarks, making it even harder than it is currently for tax authorities to verify related party sales. It is unlikely the price difference between Albemarle and SQM is evidence of transfer pricing abuse. The $1,800 average price gap in 2017 is largely explained by 1) Albemarle exporting a lower grade product due to less refining and more chloride; 2) reduced production costs than if it processed its lithium before export; and 3) price disparity between lithium sold to the U.S. versus China. However, CORFO and others are right to be concerned about the risk of Albemarle (and SQM for that matter) under-pricing lithium sold to affiliates. Large-scale lithium production is relatively new; hence tax authorities are scrambling to get up to speed on what it is, and how it is priced. It is also an opaque industry concentrated in a small number of hands. With Tesla turning to Chile to secure the lithium it needs to power mass production of electric cars, and SQM and Albemarle doubling capacity, it is critical that the government of Chile strengthen its monitoring of the industry to ensure the country gets a reasonable return from its valuable resources.